Okay, here's what's happened: You had to get out of town, fast. Maybe you just need a break, maybe you need to clear out while things blows over. Who knows. Point is, you're in your car, heading out onto a nice long stretch of nothing, when it hits you: You forgot your phone car charger. You have your dock/data connector, but that's it, and fat lot of good that does you. And you're going to be on the road a while. So what can we do? Luckily, quite a bit. See, I'm willing to bet we can slap together a working car charger for your iPhone, Android, or almost any other USB-powered device with just a bit of scrounging. This method is quick, dirty, and requires a few basic parts I think you can likely get almost anywhere, but it can be built quickly, and without much in the way of tools. Here's how. Sure, there's some slight possible risk to your phone or whatever, but, well, you're desperate. • A car adapter from pretty much any other phone, music player, nav system, handheld game, etc. So how do we do this? Well, luckily, the USB cable standard is pretty easy. Your dock cable most likely has a regular USB connector at one end, and those only have four wires: the outer two are +5V and ground, and the inner two are data. We only care about the power (outer) ones right now, and, luckily, they're colored in a standard way: red is power, black is ground. If you have a USB extender (plug on one end, socket on the other) that's the best choice, as you won't ruin your dock connector. If not, okay, we can still make it work. First, cut your cable, leaving enough length to work with, at least 3-4 inches or more on the end that goes to your phone/device, or the USB socket if you have a USB extender cable. Once the cable's cut, make a slit in the heavy outer insulation so you can see all four wires inside. Separate the red and black from the other two, which may be a number of colors. Forget the other two, and strip about an inch of insulation off the red and black wires. Set this aside. Now, that half will receive 5V and a ground line from the car. But to get 5V out of the 12V car socket, we need to rely on the electronics in almost every car charging connector, for almost any modern small electronic doohickey. The USB standard will accept between 4.4V and 5.25V, so go to that gas station, 99¢ store, or thrift store, or dumpster and look for almost any car charging cable, for almost anything. Somewhere on the lighter plug should be a label or embossed part that says how much voltage it puts out. If it's anywhere between 4.4V and 5.25, you're good. Amps should be between 0.5A and 1.5A, though some devices (iPads, for example) prefer 2 amps if they can get it. All this should be on a label on the car charger plug. Ideally, you'd use a voltmeter, but I'm assuming you have nothing but what you can find at the most basic of stores. It may seem like a store with a car charger for other, outdated phones would have one for your modern, common one, but I've seen plenty of places that don't, or, as likely, the common ones get sold out first. In a remote area, you may not have much choice. It doesn't matter what the car charging cable powered, as long as it fits in our volt range. Okay, once you have this, the rest is very easy. Cut the cigarette lighter cable, giving access to the red and black wires inside. As always, red is hot, black is ground. Take the two red wires, and twist them together. Take the black and do the same. Next, insulate the two bare wire connections as best you can, ideally with tape, if not paper, gum, bandages, anything non-conductive will work– just keep the bare parts of the red and black wires from touching! This is a very basic hack, really just a physical connector adapter, and should be simple enough for pretty much anybody to do, if they need it. 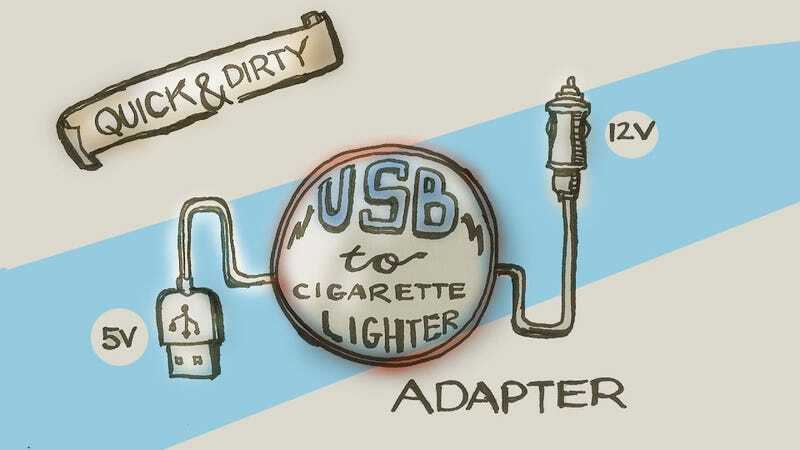 There really are a lot of devices that used car cigarette outlet plugs that converted to the right voltage: just around me know I have an old Treo adapter that would work, and an adapter from an old Alpine GPS unit that'd be fine, too. So almost any car adapters you can find could be made to work. Once that's done, plug it in the cigarette lighter, plug the other end in your device, turn on the car, and, if all went well, your phone will start charging, leaving you no longer Angry Birdless in the middle of nowhere, Montana. Good job. Now at least call your mom and tell her not to worry, and that if anything happens, you love her, ok? ADDENDUM: Some smart folks have informed me that many devices, like iPhones, like the DATA + and DATA - wires tied together in order to charge properly. So, if this doesn't work for your device, connect the two middle wires from the USB. And, for those lamenting the lack of resistors and diodes and voltage divider circuits, we may cover that later, but for now the goal of this is quick and easy. Thanks!